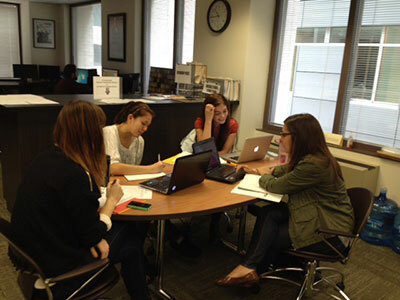 Recognizing that the need for leadership skills is fundamental in the field, Smithsonian Affiliations has recently signed an agreement to offer leadership training to staff of Affiliate museums in collaboration with George Washington Universityâ€™s Museum Studies Program.Â Â The Smithsonian has a long standing collaborative relationship with GW that encompasses internships, joint research programs, and research fellowships.Â Â GWâ€™s Museum Studies program is a nationally-known graduate training program with core curriculum in collections, exhibition development and design, new media, and museum management and leadership.Â Since conducting a survey of Affiliate staff in 2012, GWs Associate Professor of Museum Studies, Martha Morris, has worked with Affiliations Director, Harold Closter, to design a two-day seminar to be held here in Washington, D.C., on June 26 and 27, 2014, following the Smithsonian Affiliations National Conference. Museums today face incredible challenges as well as new opportunities. Globalization, new technologies, competition,Â accountability, collections preservation, financial turmoil and staffing changes are all major concerns. In addition, professional standards and ethical mandates continue to evolve.Â Museums need highly trained staff, committed governance, and innovative leaders to assure their long term sustainability.Â The 21st-century workforce demands individuals who are collaborative, flexible, imaginative, and innovative.Â The goal of this collaboration between the Smithsonian and GW is to provide opportunities for staff at all levels of the museum to gain needed skills that will position them and their organization for success. The program will provide opportunity for interaction with leaders at the Smithsonian and other museums as well as faculty of GW.Â Topics will include practical skills in management systems as well as strategic thinking and leadership philosophy.Â Â The value of the seminar will be in developing new skills as well as creating new networks for continuing professional growth. The program will be reasonably priced with a limited number of scholarships available.Â Registration will be opening in April, but we encourage you to save the dates now.Â For further information about the seminar please contact Professor Martha Morris, George Washington University Museum Studies program at morrism@gwu.edu. Photo courtesy George Washington University. It may be chilly across the country, but the temperature is not stopping Affiliates from offering great programming in February! 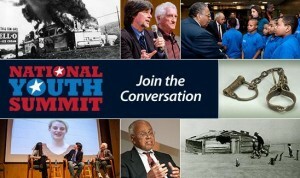 To commemorate the 50th anniversary of Freedom Summer, 12 Affiliates will join the National Museum of American History to hold a National Youth Summit, linking high school students across the U.S. in an engaging program on the history and legacy of the 1964 youth-led effort for voting rights and education, 2.5. The Durham Museum opens The 1968 Exhibit featuring three Apollo 8 artifacts from the National Air and Space Museum, in Omaha, 2.8. 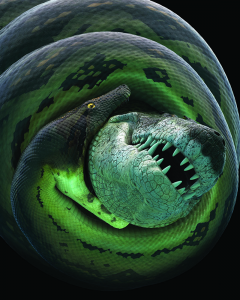 The University of Nebraska State Museum opens the Titanoboa: Monster Snake exhibition (SITES) in Lincoln, 2.22. The Putnam Museum opens Bittersweet Harvest: The Bracero Program, 1942-1964 (SITES) in Davenport, 2.15. 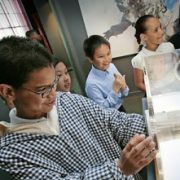 Students experience Textile Revolution: An Exploration through Space and Time, the permanent exhibition at the American Textile History Museum. For the eighth consecutive year, Citizens Bank charitable foundation donated $25,000 to the African-American Museum in Philadelphia (Philadelphia, PA) in honor of Martin Luther King Day. The funding was used to underwrite the museumâ€™s costs to offer free admission and cultural activities to more than 3,000 expected visitors. The American Textile History Museum (Lowell, MA) has received a major gift of $1 million from the late G. Gordon Osborne and his wife, Marjorie, which will go towards the museumâ€™s endowment fund. TheÂ Western Reserve Historical Society recently received a $407,000 grant from the Burton D. Morgan Foundation to work with its local school district to implement an entrepreneurial curriculum for 4th-6th graders. The 3-year program will be implemented this spring. The Oklahoma Historical Society (Oklahoma City, OK) announced the Library of Congress in Washington, D.C. has selected The Daughter of Dawn as one of 25 films inducted to its 2013 National Film Registry, a collection of cinematic treasures that represent important cultural, artistic and historic achievements in filmmaking. The 80-minute, six-reel silent movie was shot during the summer of 1920 in Oklahomaâ€™s Wichita Mountains Wildlife Refuge outside of Lawton. Charlene Donchez-Mowers and the Historic Bethlehem Partnership (Bethlehem, PA) have been named the recipients of the seventh Tribute to Historic Preservation Award sponsored by the Sun Inn Preservation Association. The board of governors of the Strategic Air and Space Museum (Ashland, NE) announced that Michael McGinnis has been appointed as the museumâ€™s new Executive Director. The T. rex unearthed in Montana in 1988 will arrive at the National Museum of Natural History on April 15 on a 50-year loan by the U.S. Army Corps of Engineers. The Smithsonian is planning a new, 31,000-square-foot dinosaur hall that is scheduled to open in 2019. 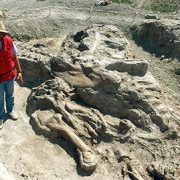 Jack Horner, Curator of Paleontology at the Museum of the Rockies, provides scale for Tyrannosaurus rex fossils at the excavation site near the Fort Peck Reservoir in Montana in June 1990. Named for its discoverer, Kathy Wankel, the Wankel T.rex is estimated to have weighed six to seven tons. Photo courtesy Museum of the Rockies. The American Textile History Museum in Lowell, MA has received a major gift of $1 million from the late G. Gordon Osborne and his wife, Marjorie, who passed away last year. Education and access have always been at the core of all of our work. Our Affiliate network provides countless opportunities for informal learning in local communities across the U.S. through research, scholarship and exhibitions both real and virtual. 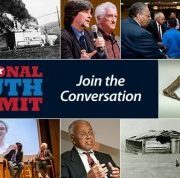 Many Affiliates have collaborated with the Smithsonian on online national summits for teens, science webcasts, and even collected oral histories all captured for a virtual audience as well as developed as engaging public programs at each organization. Weâ€™ve invited Smithsonian Secretary, G. Wayne Clough, to be our Keynote Speaker at our 2014 Affiliations National Conference* (June 23-25) to share how Affiliates are our partners in tackling a digital world. Join us on June 24 and discover the possibilities when we partner in making our collections more accessible and provide lifelong learning experiences to all of our visitors through innovative digital access. To read the Secretaryâ€™s free book Best of Both Worlds: Museums, Libraries, and Archives in a Digital Age and see a short video, go to http://www.si.edu/BestofBothWorlds. The book is also available for free atÂ iTunes U. Read the full press release for the Secretaryâ€™s e-book here. *The Smithsonian Affiliations National Conference is for current Affiliates only. If you are interested in becoming an Affiliate, or have an application in progress and would like to attend the Conference, please contact Elizabeth Bugbee for more information. A special thanks for this guest post to Michelle Beumer, Restoration and Social Action Coordinator at the Patricia and Phillip Frost Museum of Science in Miami, Florida. 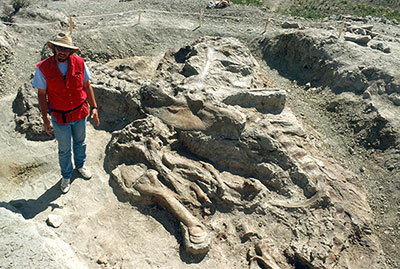 Ever wanted to be a Paleontologist? Last Thursday, over 100 fifth grade students from Goulds Elementary School in Homestead got to experience a day in the life of a paleontologist. 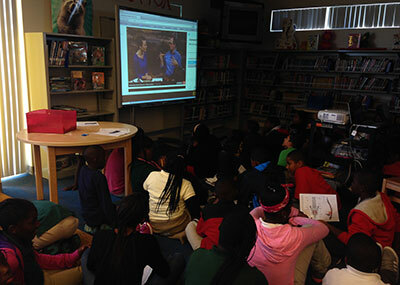 Through a partnership with the Smithsonian Institutionâ€™sÂ National Museum of Natural History, the Patricia and Phillip Frost Museum of Science staff joined Goulds Elementary students for a fossil whalebone scavenger hunt, a live science webcast with Dr. Nick Pyenson, and a question and answer session hosted by the National Museum of Natural History in Washington D.C.
Patricia and Phillip Frost Museum of Science staff member, Ta-Shana Taylor is our very own whalebone expert, and guides the students through their scavenger hunt activity. Photo courtesy Frost Museum of Science. To jump-start the immersion experience, students were sent on a mission to hunt for special whale fossils. 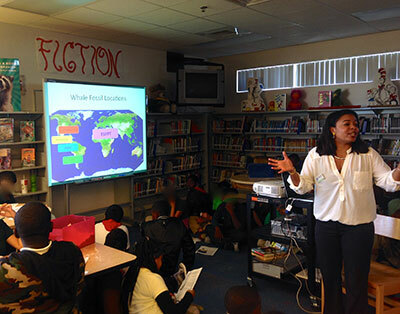 Â Through various stations, students took a trip around the world exploring different fossil-rich locations. Students dug through buckets of sand (not unlike real paleontologists) to find their bone.Â Working as a team, students then had to figure out the story of their whalebone in a broader picture by comparing results in each of the five world locations. Then Smithsonian scientist Dr. Nick Pyenson discussed his research on the webcast and showed some of the specimens that be found through his work in Peru, Chile, the eastern United States, Panama, and Vancouver, while answering questions that students from around the country asked via a live chat window. 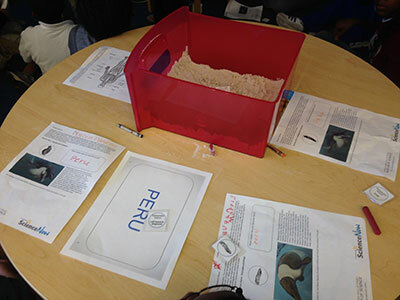 The students from Goulds Elementary learned basic whale anatomy and how that corresponds to our own human anatomy,Â what whale species are rare and common now versus millions of years ago, and how paleontologists discover and dig up history. 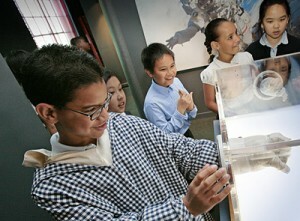 Photo courtesy Frost Museum of Science. The new Q?RIUS (pronounced â€œcuriousâ€) collectionÂ at the National Museum of Natural History will be presented through a series of live webcasts. From January until June 2014, nine live webcasts will air that examine a wide range of scientific topics that are perfect for you and your classrooms to watch, participate in, and enjoy. Each webcast is based on the Next Generation Science Standards and entices students to explore core science concepts through real-world connections. Explore the topics in the scheduleÂ to access a package of classroom activities, lessons, readings and other related resources that support each webcast program. Join us in our scientific adventures and tune in to watch real Smithsonian scientists talk about their research and answer your questions, live! Join the Patricia and Phillip Frost Museum of ScienceÂ and the National Museum of Natural History on February 12thÂ to become Bird DetectivesÂ with featuring Carla Dove. 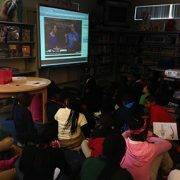 Students watching the Q?RIUS webcast from the National Museum of Natural History in Washington, D.C. Photo courtesy Frost Museum of Science.